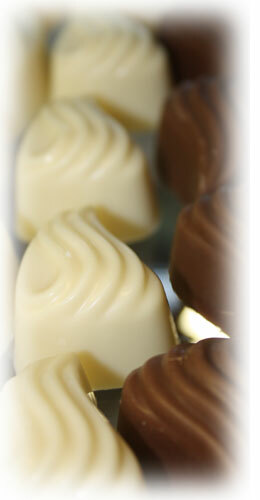 Officially, there are three kinds of chocolate: dark chocolate, milk chocolate and white chocolate. Dark chocolate contains cocoa mass (also called cocoa liquor), cocoa butter and sugar. The content of cocoa solids that is the dried fraction of all cocoa substances varies between 35 and 70% or more. The higher the cocoa content, the more bitterness you will experience. To real chocoholics, there is only one real chocolate: very dark, bitter chocolate with a very high cocoa content. Milk chocolate contains the same ingredients as dark chocolate, with milk powder added to give the chocolate a lighter brown color and a creamy texture and taste. For certain recipes, we even select special milk powders that develop a caramel kind of flavor. White chocolate contains milk, sugar and cocoa butter but no cocoa liquor (cocoa mass). That explains the pale, ivory color of this sweet chocolate. Couverture Chocolate is a chocolate with a high fat content of at least 31% and mainly produced for bakers, pastry chefs and chocolatiers. This means at least 31% cocoa butter in dark chocolate, and 31% of cocoa butter and milk fat in milk chocolate. This gives the chocolate an extreme richness and "hardness", and the ability to create astonishing pralines with a very thin yet crunchy chocolate layer.